St Pancras railway station, also known as London St Pancras and since 2007 as St Pancras International, is a railway station terminus known for its Victorian architecture. The Grade I listed building stands on Euston Road in St Pancras, London Borough of Camden, between the British Library, King's Cross station and the Regent's Canal. It was opened in 1868 by the Midland Railway as the southern terminus of its main line, which connected London with the East Midlands and Yorkshire. When it opened, the arched Barlow train shed was the largest single-span roof in the world. After escaping planned demolition in the 1960s, the complex was renovated and expanded during the 2000s at a cost of £800 million with a ceremony attended by the Queen and extensive publicity introducing it as a public space. 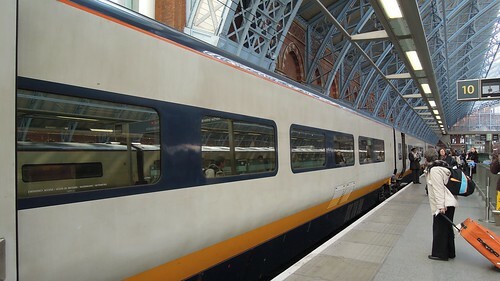 A security-sealed terminal area was constructed for Eurostar services to Continental Europe via High Speed 1 and the Channel Tunnel, with platforms for domestic trains to the north and south-east of England. The restored station has 15 platforms, a shopping centre and a bus station, and is served by London Underground's King's Cross St Pancras tube station. St Pancras is owned by London and Continental Railways, along with the adjacent urban regeneration area known as King's Cross Central, and is one of 17 British stations managed by Network Rail. The longer international platforms, used by Eurostar, extend a considerable distance southwards into Barlow's train shed, whilst the other platforms terminate at the southern end of the 2005 extension. The international platforms do not occupy the full width of the Barlow train shed, and sections of the floor area have been opened up to provide natural light to the new ground-level concourse below. Arrival and departure lounges lie below these platforms, and are reached from the international concourse. The concourse, known as The Arcade, was fashioned from the original station undercroft and runs the length of the Barlow train shed to the western side of the arrival and departure lounges. The southern end of the international concourse links to the western ticket hall of King's Cross St Pancras tube station.